CHICAGO – One of the growth areas in the Chicago film scene has been in academia, as traditional liberal arts universities in the area have been expanding their teaching programs and becoming more influential, in concert with the overall growth of the film industry in the Windy City. One such academic leader is DePaul University, an institution that has become one of the Top 25 film schools in the nation, through their Cinematic Arts program and innovations like their new Big Shoulders International Student Film Festival. Assistant Professor Anuradha Rana is part of that success. Anuradha Rana was born in New Delhi, India, and came to Chicago to complete her MFA in Film and Video. Along the way to that achievement, she has produced, directed and been a camera operator on documentaries filmed in India, Ecuador, Japan, South Africa and the United States. 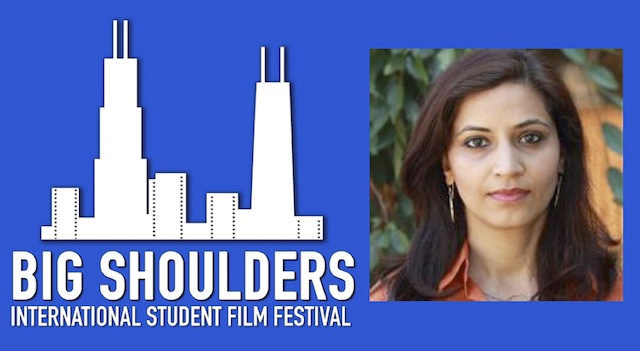 At DePaul University, Anuradha founded the MFA in Documentary and the BFA in that same category concentration, and currently teaches cinema production, directing and screenwriting. In 2018, she was the co-founder and facilitator of the initial Big Shoulders International Student Film Festival, which has recently called for 2019 Festival submissions (upcoming on February 1st and 2nd). In the following Podtalk with Patrick McDonald of HollywoodChicago.com, Anuradha Rana expresses her views regarding the initial Big Shoulders Festival, and the overall cinema scene in Chicago. The Big Shoulders International Student Film Festival, presented by DePaul University, is now taking submissions for its 2019 Festival, February 1st and 2nd. For more information, click here.